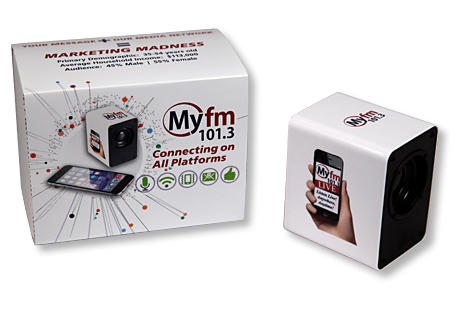 For MyFM 101.3 radio station and media, this concept was developed as a fun promotional leave-behind that consists of a package with a custom-designed outer sleeve and a branded / imprinted mini speaker for the recipient to place on their desk. This helps the folks at MyFM 101.3 to present and promote their multi-platform marketing offerings that span radio, online streaming, mobile, direct eMail and social media: their client’s message and their media network as an unbeatable combination! All images are the property of their respective owners. Reproduction prohibited without written consent. © 1991-2019 Miele-Fleury Graphics. All rights reserved. | Web Hosting by Ashdown Technologies, Inc.